have a dense interior and a slightly crispy crust. Sprinkle the yeast into 1 cup of the warm water. Add the sugar. Allow to rest for 5-10 minutes until foamy. In a large bowl, combine the flour, salt, and fennel seeds. Add the yeast mixture to the flour. Stir to combine the ingredients; add the remaining water if the mixture is too dry. Transfer the mixture to a lightly floured surface. Knead to make a smooth dough. Form the dough into a ball. Transfer the dough to a greased bowl. Cover the bowl with a kitchen towel. Allow the dough to rise for 1-1/2 to 2 hours or until almost double in size. Punch the dough down and divide it into 4 equal size pieces. Shape the pieces into a round roll. Place the rolls on a greased baking sheet. Cover the rolls with a kitchen towel and let them rise for 1 hour. Brush the top of each roll with some olive oil. With a sharp knife, cut a cross into the top of each roll. Bake for 15 to 20 minutes, or until the rolls are golden brown. Remove from the oven and cool on the baking sheet. 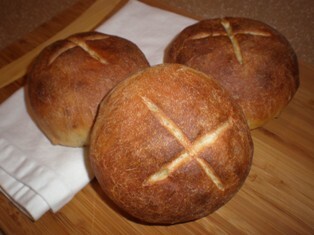 DO YOU LOVE TO BAKE BREAD?